OTTAWA -- The Liberal government has officially abandoned its promise to balance the books by 2019, forging ahead with plans to spend billions on infrastructure projects and tax benefits for the middle class amid significant deficit projections for the next four years. 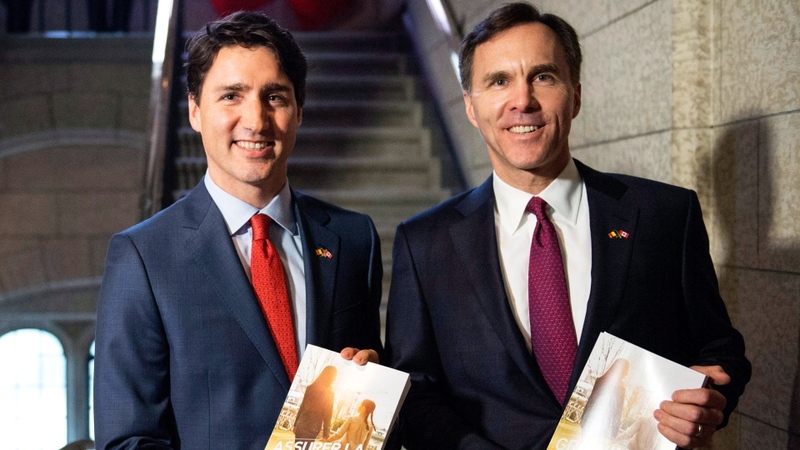 Finance Minister Bill Morneau’s first budget, tabled on Tuesday, projects deficits of $29.4 billion this year and $29 billion in 2017-18 – nearly triple the maximum amount of “modest” annual deficits the Liberals promised to run over three years. By 2019-20, the government is expected to run a deficit of $17.7 billion instead of a balanced budget, as promised. The federal debt is projected at $718.2 billion for that year. 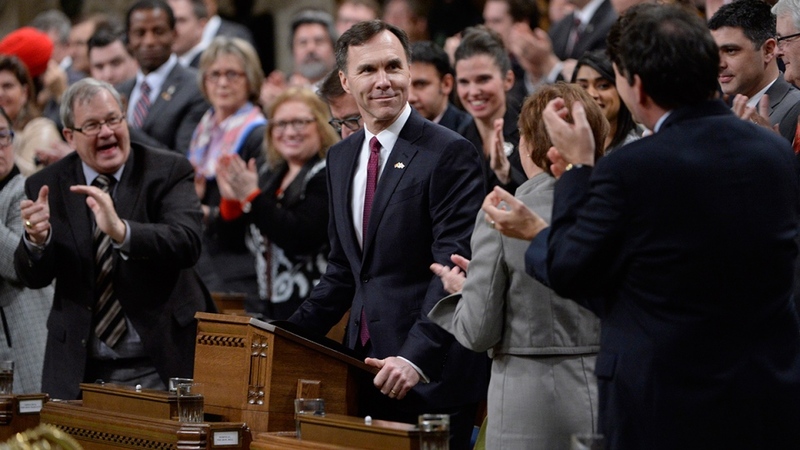 In his speech to the House of Commons on Tuesday, Morneau called the Liberals’ budget plan “reasonable and affordable” at a time when declining oil and commodity prices are hurting the economy. Interim Conservative leader Rona Ambrose said the budget breaks key Liberal campaign promises to keep the deficit at $10 billion and to return to a balanced budget by 2019. The budget increases taxes and hurt small businesses, which had counted on a reduction of the small business tax rate, according to Ambrose. She pointed out that the budget also cancels a hiring tax credit. Morneau, the finance minister, defended the size of the deficit in an interview with CTV Power Play host Don Martin. “Anyone thinking about balancing the budget is talking about enormous cuts,” he said. “Higher growth will get us to a balanced budget,” he added. 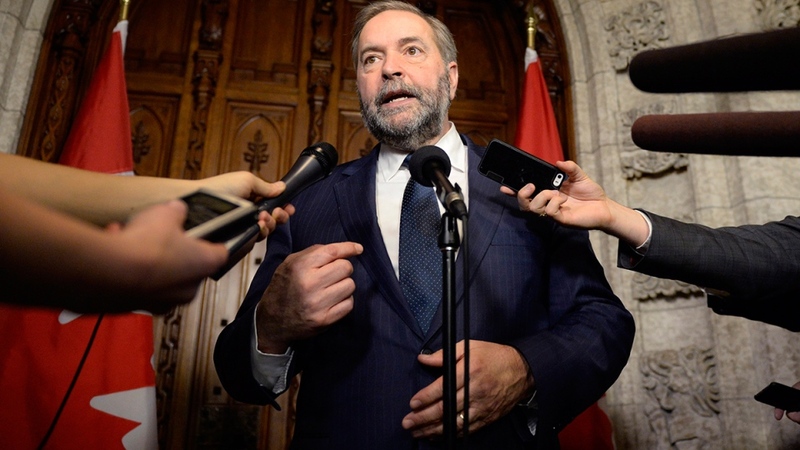 NDP Leader Tom Mulcair said the budget doesn’t fulfil several key campaign promises to First Nations children, seniors in poverty and 150,000 Canadians waiting for Employment Insurance. “The Liberals are back to their old tricks of stealing $6.9 billion from the EI fund and putting it back into general revenues,” he said. The Canadian Taxpayers Federation slammed the Liberals for a budget they say will increase program spending by a projected $44 billion or 16 per cent by 2020, including seven per cent next year alone. “If this government held a contest to pick a title for this budget, the winner would probably be Spendy McDebtface,” said CTF federal director Aaron Wudrick. “The biggest ‘change’ on offer here is absolutely no plan to get back to a balanced budget,” Wudrick added. Dan Kelly, president of the Canadian Federation of Independent Business, called it a “brutal budget for small businesses,” considering that the Liberals had repeatedly promised to cut the small business tax rate from 11 per cent to 9 per cent. Pressed about the lack of tax cuts for small business, Morneau told Don Martin that boosting the fortunes of the middle class helps all small businesses. The Liberals have already implemented a new tax package that reduces income tax rates for middle-class earners and raises taxes for Canadians earning more than $200,000 per year. In Tuesday’s budget, the government outlined the other major component of its much-touted plan to boost the middle class. The new, tax-free Canada Child Free Benefit will allow low-and-middle income families to collect more money, with the maximum annual benefit of up to $6,000 per child under the age of six and up to $5,400 per child aged six through 17. Tax expert Tim Cestnick said he is surprised by the magnitude of the new benefit, which would offer as much as $10,800 a year to a family with two children earning $30,000 or less. “This is a Robin Hood budget taking from higher incomes and giving it to those with lower incomes,” he said.